Spinning yarn and knitting are two passions in my life. I'd rather spin than eat. The Hilbert curve, the Sierpinski carpet and Sierpinski gasket are fractals. I've done some charts and you will find them here. Here is my version of the venerable watchcap. Knitted in soft, warm wool or a sensuous blend of wool and silk a watchcap will hug your ears and keep them warm! The Knots have been moved to their own page. 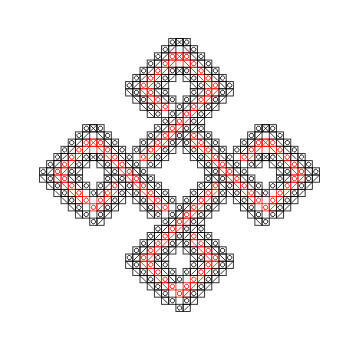 They are lace interpretations of Celtic knots. These are not whole patterns for anything, just charts for the lace. Celtic Key designs are on another page. The knot and key designs are fairly complex charts for lace knitting. If you have never followed a chart before please take a few minutes to look at the chart and the symbol key. I cannot translate these patterns into written out instructions. Socks There's nothing quite like hand knitted socks. The Moebius Scarf I love this scarf. It has a half-twist in it so it has only one edge. You can fold it over your head or wear it loose. There are a lot of free knitting patterns on the 'Net. Wool Works is a great place to start. Sara Bradberry has a superb pattern collection. All her patterns are posted with permission of the copyright holder or are public domain patterns.